Smart Home for Your Contacts. Where your Contacts Live. Welcome to the Business Contact Book official website, where you can find information about all features, latest versions and future releases, program versions, and special offers. 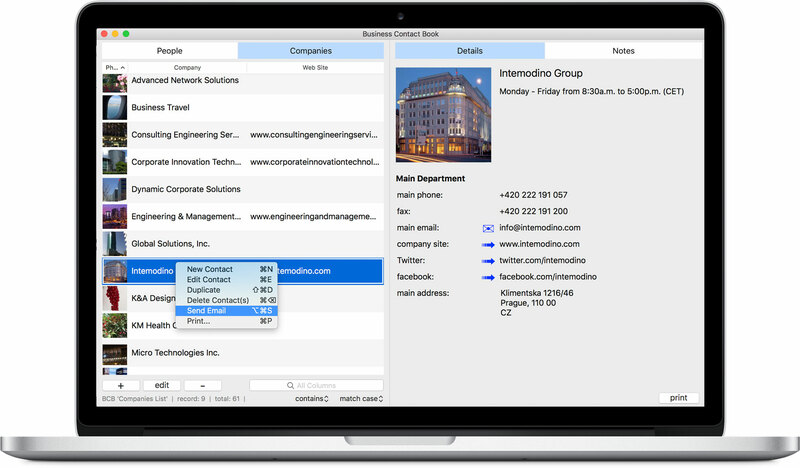 Business Contact Book is an intuitive yet powerful contact manager that helps you organize, catalog and efficiently manage your lists of personal and business contacts in one place. 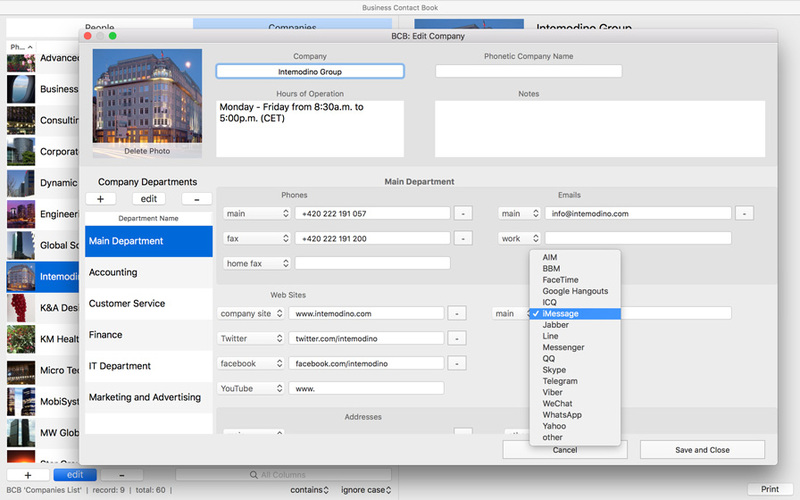 Providing the right balance between practical functionality, usability and simplicity in user interface design, BCB is a good choice for individuals looking for an ordinary address book or phone book app as well as professionals, small businesses and companies of any size who require advanced options for structured contacts organization and management. 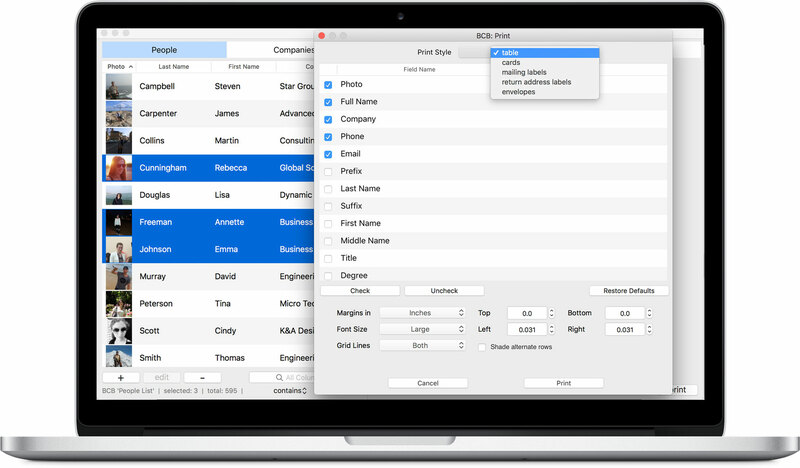 Download Business Contact Book for Mac. Every business, like every person, is unique. So, we provide a flexible contact management application that allows individual users and entire organizations to customize the app the way that best meets their needs. 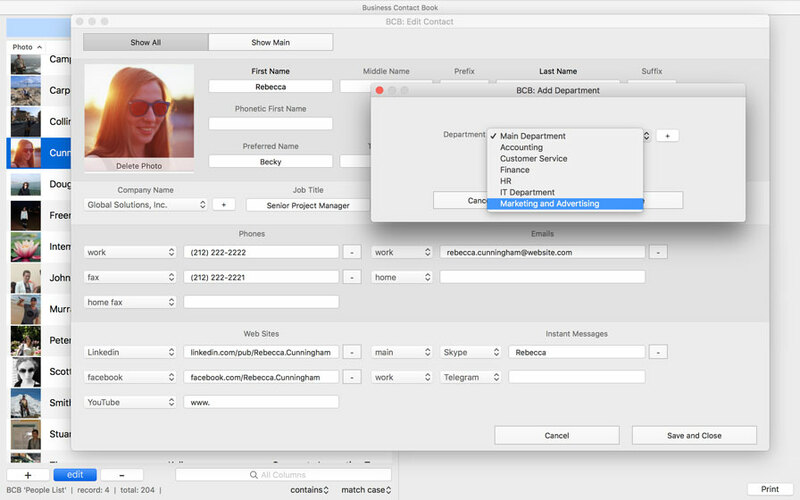 BCB is a contact organizer with special options such as records linking, quick search, sending emails capabilities and automatic and manual backup options. BCB is an advanced contact management solution that offers the Trash option to easily restore deleted contacts, automatic and manual backup options, flexible printing options, including the option to print mailing labels, advanced searching and filtering for tracking the complex structure of contacts. Business Contact Book is a well-organized and easy to navigate app with extended functionality to manage your personal and business contacts. Thanks to its intuitive interface and complete feature set, Business Contact Book is the best software to manage your existing contacts and make new ones. 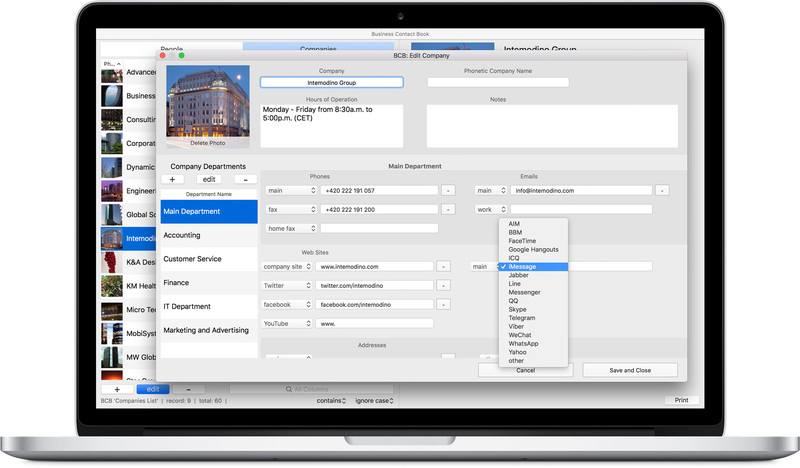 The core Business Contact Book functionality is contacts organization. Depending on the information type, contacts are stored in two linked lists. People list and Companies list are stored separately making it easy to manage and sort your contacts in the way that meets your needs and find contact details. 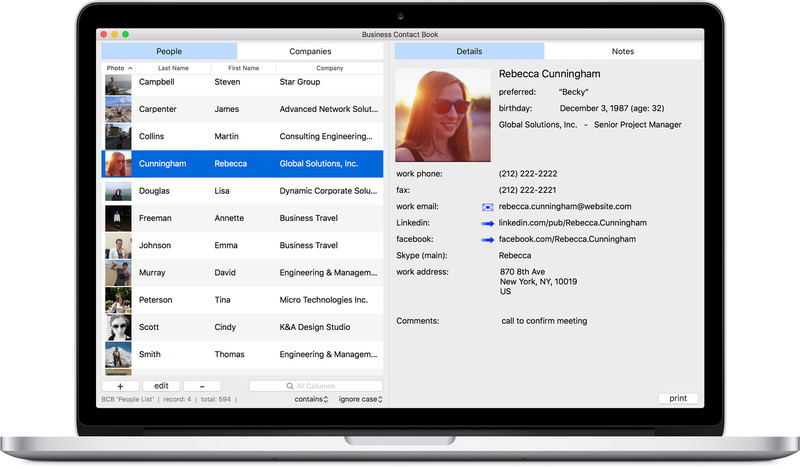 You can easily locate personal and business contacts by switching between People and Companies list. For more visualization, you can add photos to any contact. 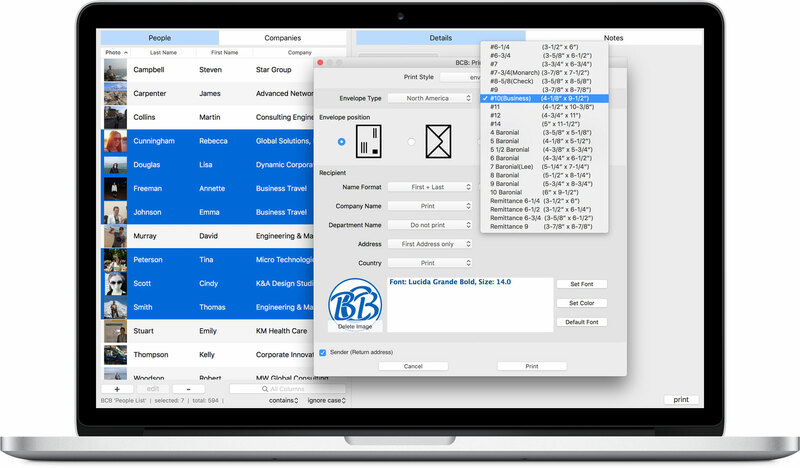 With BCB you can store and manage large contact lists. 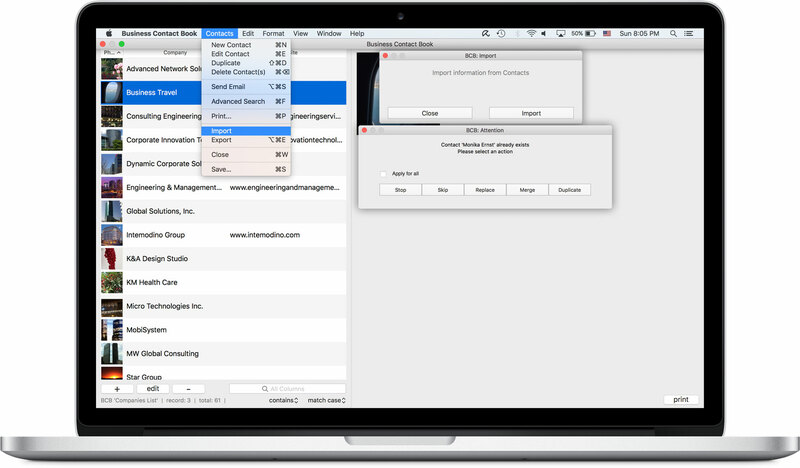 For faster performance, Business Contact Book uses SQLite. 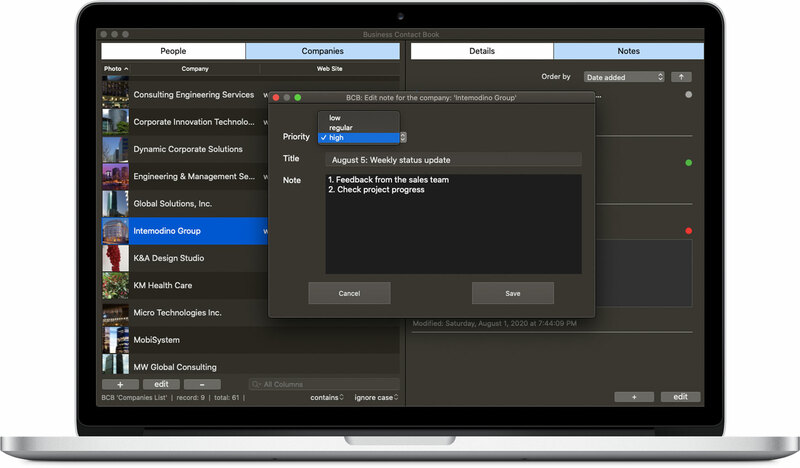 Looking for a quick way to manage information for companies, departments and employees? If people work at the same company (optionally, department), you may add a company or department only once and then simply select them. So, the company and department information is shared by many personal contacts. BCB provides is a handy solution to store the list of employees within the company structure. You can establish the following linking: person - company, person - department - company, department - company. We understand how important is to prevent accidental data loss. That's why Business Contact Book provides Trash and Backup options. Accidentally deleted important contacts? With the Trash option enabled, you can easily restore them. When you delete contacts in Business Contact Book, they are moved to the app's Trash. Deleted contacts will be there until you delete them from the Trash or empty the Trash, so you can restore them with one click. 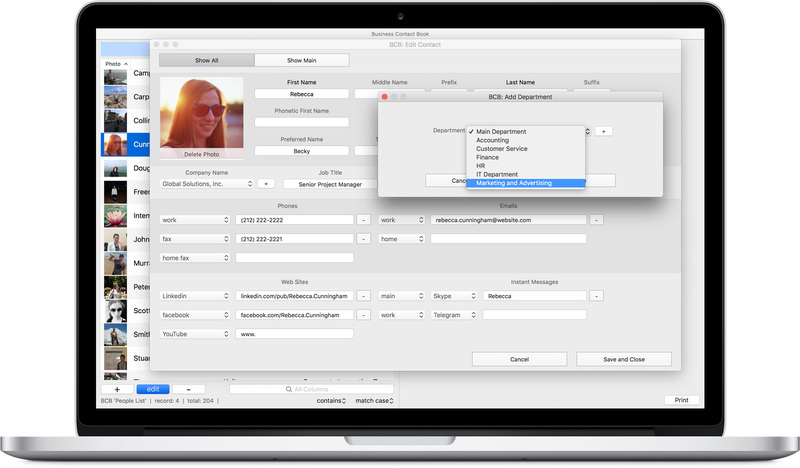 To protect your contacts from system or power failure or to transfer your contacts to another computer, BCB offers the advanced Backup option that allows you to easily create copies of all BCB contacts, including photos. The Backup option includes the Auto backup and Manual backup option. 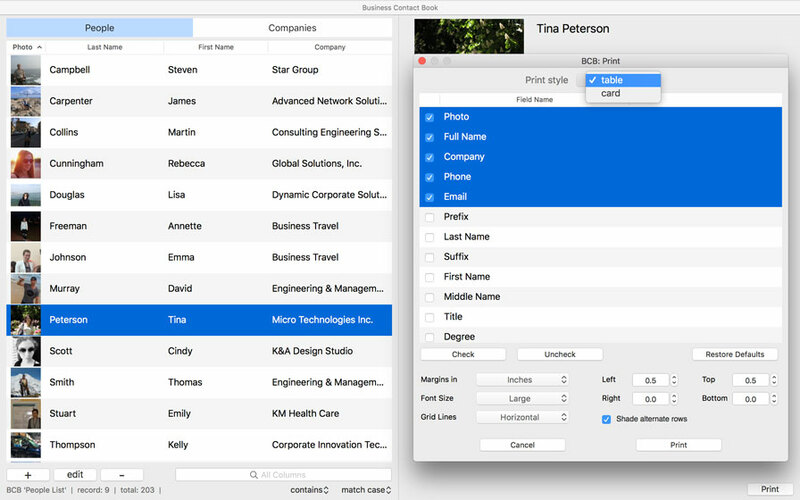 With Auto-Backup enabled, each time you quit the app, shut down/restart your Mac when the app is running and before importing new contacts, Business Contact Book automatically creates backups of your contact database, including photos. So, you can easily load the necessary backup using the Load option. With the Manual Backup option, you may create manual backups that can be easily loaded on any computer where BCB is installed. 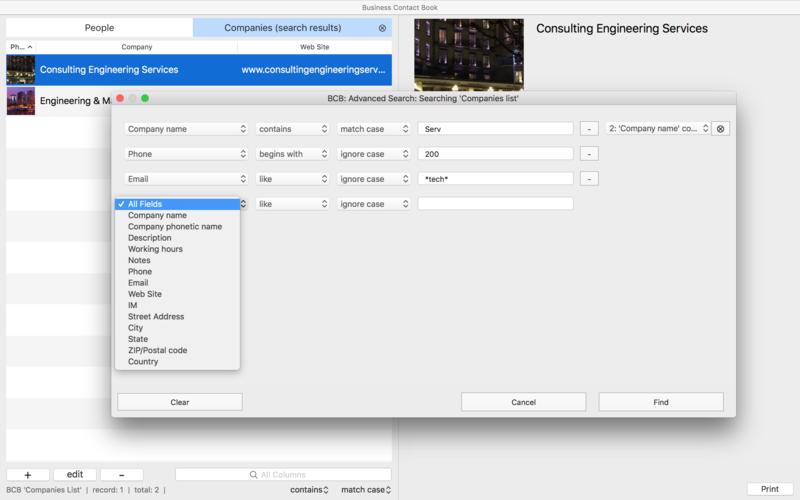 The Quick Search option lets you search contacts in the "People" and "Companies" lists and even in the Trash by creating various filters to display contacts that match certain conditions. You can search either in all columns or in a certain column of the selected list. Just enter a word or a phrase in the Search field and press Return. With the Advanced Search option you may easily search your contacts, including contacts in the Trash, for any information from job titles, departments and companies to location, phone numbers and email addresses. For example, you can quickly find the people who work for a certain company or the people who live in your city and whose phone numbers begin with "212". You can also find contacts by parts of contact details. Sort your contacts according to various criteria. While the column's header you click first has the main sorting priority, all other columns are also used for deeper sorting but with lower priorities. E.g. if you click the 'First Name' header, all contacts will be sorted by 'First Name' and contacts with the same 'First Name' will be additionally sorted by 'Last Name'. Just click the column's header to get your contacts sorted. Click twice to change the order. You can also change the column width to automatically fit the contents (AutoFit). Business Contact Book comes with various printing settings making it incredibly easy to customize and optimize the information you want to print and helping you take more control over the printing process to achieve the best results. You can choose the fields you would like to print, print your address book records as personal or business cards or lists as well as save contact information into a pdf file. 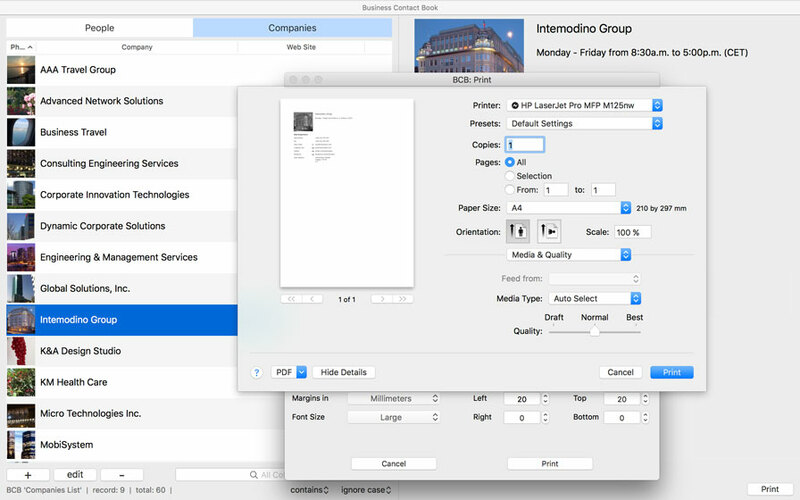 And, of course, you can configure page setup before printing. Learn more about Print Reports. 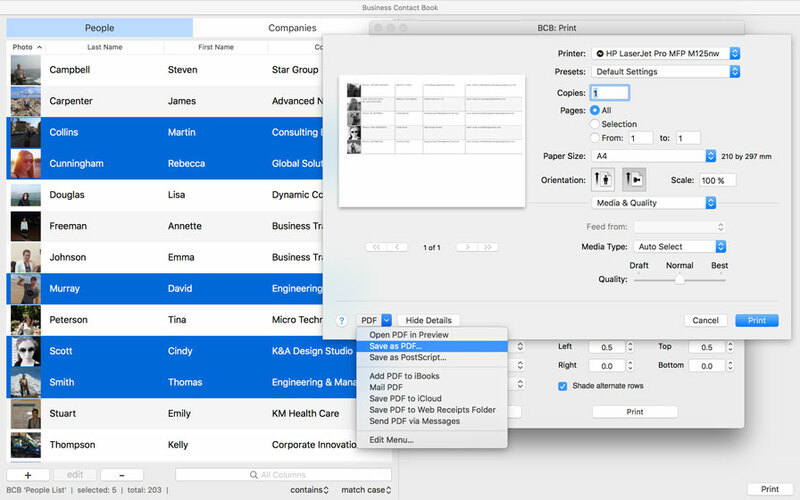 Need to print mailing labels to send letters to your clients, colleagues, friends or family? Save you time and give a more professional look for letters and packages with Business Contact Book. 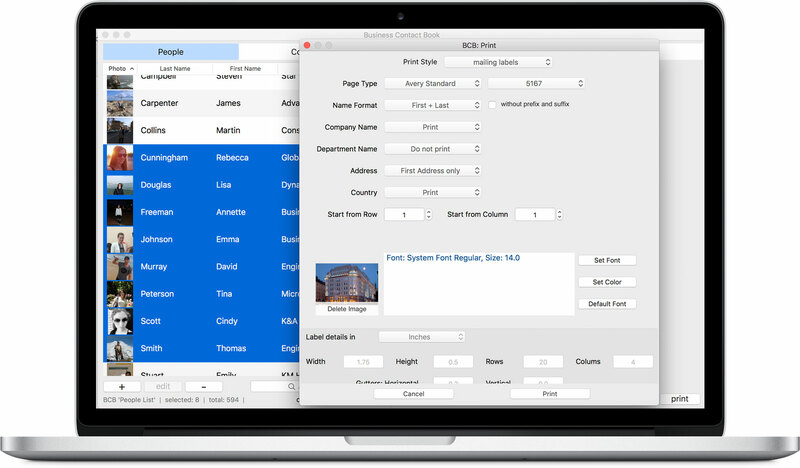 From version 3.6.0, you may print mailing labels, shipping labels and return address labels for business and personal use using information in BCB. Looking for an easy way to print Name labels for a corporate and personal event? BCB is here to help. If you have any questions or need help with Business Contact Book, please visit the BCB online help section with the detailed getting started instructions or contact our Support Team. As always, we welcome your feedback. Our developers review the ideas that we receive from our users to implement them into the product.